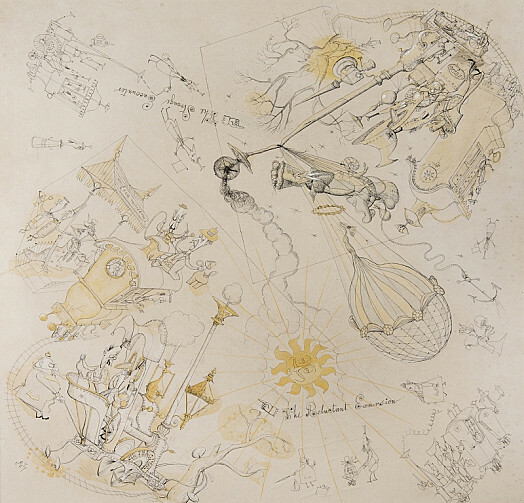 Rowland Emett established himself as the creator of elegant and whimsical cartoons during the 1930s, while working as an industrial draughtsman. In 1951, he reached a wider public with his designs for The Far Tottering and Oyster Creek Railway, which was sited at Battersea Park during the Festival of Britain. Gradually, he converted more of his illustrations into increasingly complex three-dimensional machines. Both drawings and inventions helped cheer a nation fed up with years of austerity. 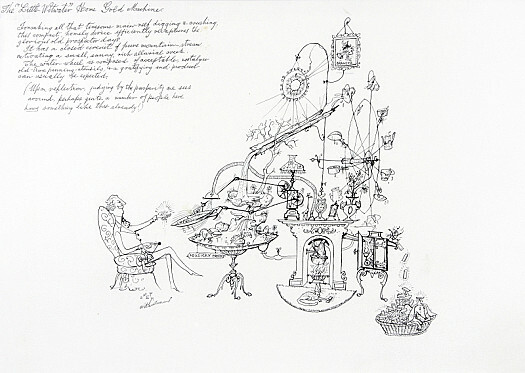 Rowland Emett was born in New Southgate, London on 22 October 1906, the elder son of the proprietor of a small advertising business. Educated at Waverley Grammar School, Birmingham, he showed his father’s enthusiasm for invention, and registered his first patent at the age of fourteen. However, he had ambitions to be a landscape painter and studied with great success at the Birmingham School of Art. The combination of artistic and scientific talents allowed Emett to work as an industrial draughtsman while contributing with increasing regularity to Punch, Lilliput and other magazines from the late 1930s. 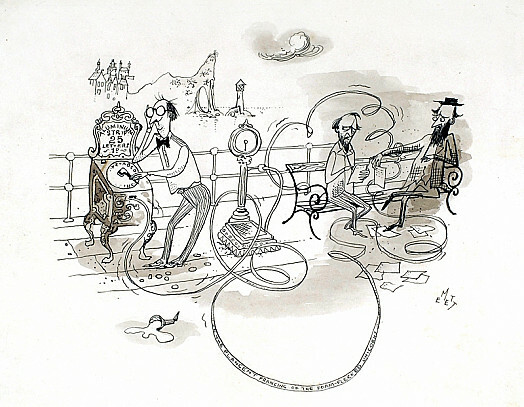 During the Second World War, Emett worked as a draughtsman on the development of jet engines. 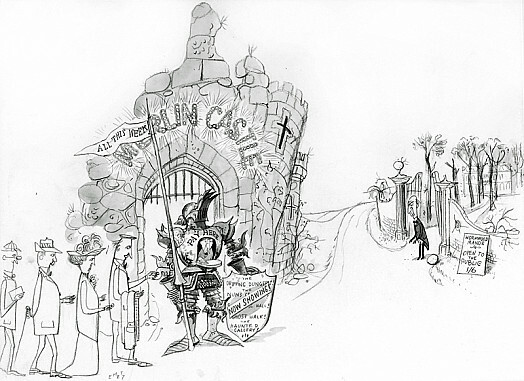 In 1941, he was chosen to illustrate Bells and Grass, a series of humorous rhymes that Walter de la Mare had originally written for Punch. 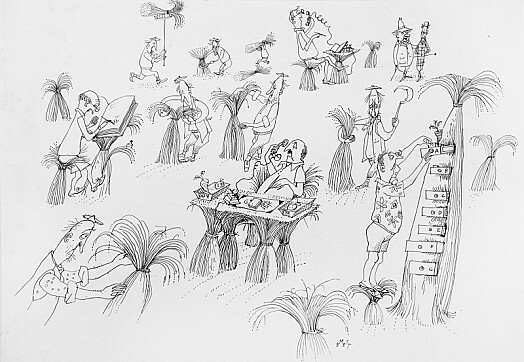 The poet was so impressed by the result that he immediately encouraged Emett to illustrate an edition of his more famous book, Peacock Pie. In the same year, Emett married, and he and his wife set about producing the delightful children’s book, Anthony and Antimacassar (1943). About the same time, Emett’s cartoons began to be collected in volume form, A Book of Curious Happenings (1943) initiating a series that culminated in Far Twittering (1949). 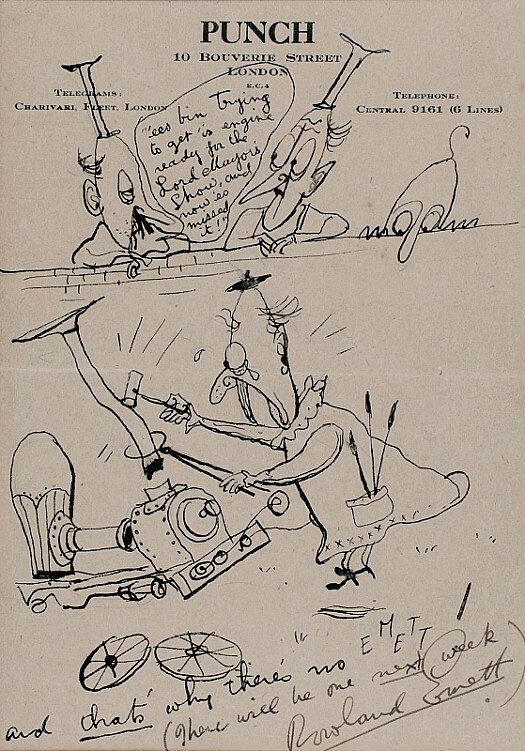 In 1951, Emett reached a wider public with his designs for The Far Tottering and Oyster Creek Railway, and its featured engine, Nellie, which was sited at Battersea Park during the Festival of Britain. 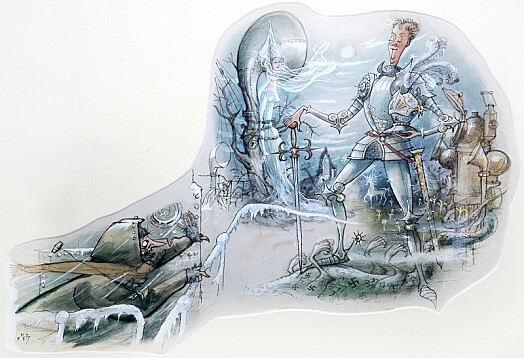 As his eyesight faltered, he converted more of his illustrations into increasingly complex three-dimensional machines that, from 1956, he constructed himself at a blacksmith’s forge near his home in West Sussex. He received international success, through his work on the film, Chitty Chitty Bang Bang (1968), when he gave substance to the adventures of the inventor, Caractacus Potts. He achieved this by employing a team of assistants to help him make eight of his machines for the filming and a further 37 for international promotional purposes. These and other inventions continue to prove popular throughout the world and remain on public exhibition in such esteemed institutions as the National Air and Space Museum in Washington. 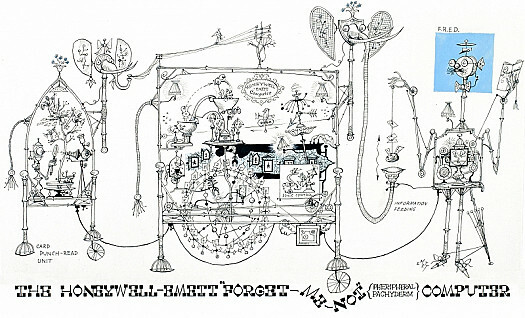 A parodist of the real world of functional engineering, Emett had long proved to be the Genius of British Eccentricity, a fact acknowledged by his being awarded an OBE in 1978. 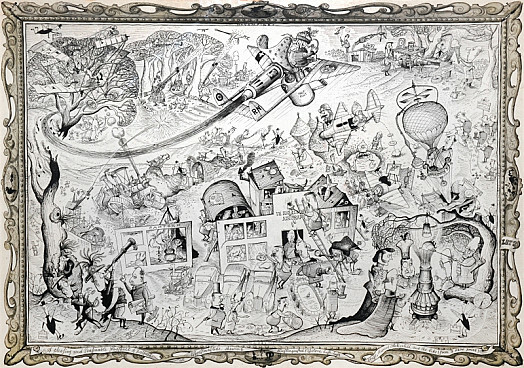 This was confirmed by the overwhelming response to the most important exhibition of his career, ‘Rowland Emett: From “Punch” to “Chitty-Chitty-Bang-Bang” and beyond’ at the Chris Beetles Gallery in 1988 and, augmented by a number of the machines, at the Smithsonian Museum in Washington. He died on 13 November 1990 in a nursing home in Hassocks, Sussex, close to Wild Goose Cottage, his home in Ditchling. 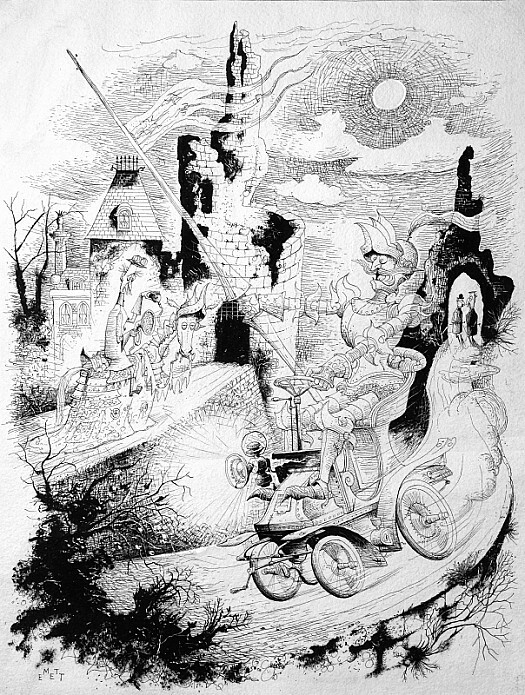 His work is represented in the collections of The Cartoon Museum, Tate and the V&A. His open air sculptures can be seen at the Victoria Centre, Nottingham and Eastgate Shopping Centre, Basildon; and at the Mid America Science Museum (Hot Springs, Arkansas) and the Ontario Science Center (Toronto). A Plague On These Machine-Age Poets...!